Pure raw chocolate nibs. Antioxidant Superfood. Cacao, or Theobroma cacao, is the source of original, natural chocolate. It comes from the seeds of the fruit of the cacao tree and is ground into nibs. Chocolate is one of the worlds most loved food and this superfood is carefully dried and processed at 47 degrees Celsius. This low temperature keeps vitamins, minerals and antioxidants intact. Benefits Help with weight loss Helps with muscle and nerve function Prevents anaemia Reduces risk of Coronary heart disease Treats diarrhoea Ingredients 100% cocoa nibs. Dosage Eat them whole, plain or dipped in honey. Can be added to a trail mix, can be ground and added to desserts. May have a stimulating effect, so consumption can be adjusted according to experience. High in antioxidants. Provides the body with essential nutrients. Provides the body with energy. Aphrodisiac. Cocoa beans are the seeds of the cocoa fruit- a nut which grows on a jungle tree. Cocoa is 100% pure dark chocolate. 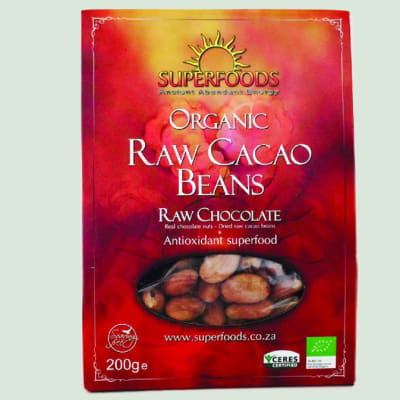 Raw cocoa has a rich history of use as a superfood and was believed to provide essential nutritional integrity to support optimal functioning of being. Benefits High in antioxidants Provides the body with essential nutrients Provides the body with energy Aphrodisiac Ingredients 100% organic raw Cocoa Beans Dosage Eat them whole, plain or dipped in raw honey. they can be ground to a rich dark powder using a coffee grinder to make raw desserts. Blend them into your favourite smoothies or add them to trail mix with goji berries and raisins. Skins are edible so you don't need to peel them first. The recommended daily intake is 5 to 20 whole beans. beans can be stimulating so adjust consumption according to experience. Prepared at low temperatures keeping delicate vitamins, minerals and antioxidants intact.